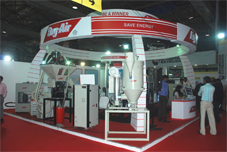 Bry-Air (Asia) participated in 8th Plastivision India 2011, an International Plastics Exhibition & Conference held at Mumbai, from 20-24 January, 2011. Br-Air presented at Hall # 1, Row C3, C4, Booth # 7. Bry-Air, a distinguished player in the field of Drying, Conveying & Blending, Mould dehumidification, heating & cooling demonstrated Gen-X machines from its comprehensive range. This extensive range of machine provides plastic processors with the superior drying, conveying & blending capabilities. Bry-Air has been engaged with plastic industry for more than four decades, and showcased its Conveying Systems, Mould Dehumidification System, Honey Comb Resin dryer, Mould Temperature Controllers, Industrial Chiller, Gravimetric blending unit, Hot Air dryers, Auto loaders and other auxiliary equipments. 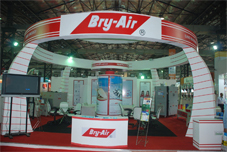 Bry-Air is one of the largest privately held HVAC company from India with a global manpower strength of 1000+. Bry-Air has more than three decades of experience in the field of dehumidification & environment control solutions. It specializes in designing and manufacturing plastic auxiliary equipments handling applications like Automobile Plastics, PET, Medical Plastics. Also, Bry-air is world leader in manufacturing of desiccant based engineered dehumidification systems capable of handling demanding applications such as Pharmaceutical, Food Processing, Turbine Storage, Cold Storages etc. Bry-Air (Asia) has been at the forefront of dehumidification and industrial air treatment technology with product range that also includes Gas Phase Filtration System, Resin Drying equipments, Product Dryers and complete environmental control systems. Bry-Air (Asia) has production Plants in India, Malaysia, China and Europe and representative offices in Middle East, South Africa, Philippines, Thailand, Italy, Korea, Japan and Australia. The company’s range of products find application globally across 40 countries including South East-Asia, China, CIS countries, Indian subcontinent, West Asia, Middle East and Africa including South Africa & Australia as well as USA and Japan.